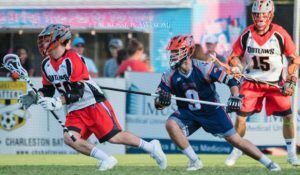 On August 18, 2018, the MLL Championship game was held at the MUSC Health Stadium in Charleston, S.C. and in front of 4,086 fans two teams would battle it out to cap off one great season. The two remaining teams had the most explosive offensive attacks; as well as the best defensive units; top notch midfielders, goalkeepers and FOGO’s. Dallas had defeated Denver twice this season and both by the score of 13-12. However, the third time would not be a charm for the Rattlers who have nothing to be ashamed of in this, their inaugural season in Texas. Try as they may try as they might, the Rattlers just could not out-will the Outlaws on this night in Charleston which was a first time endeavor for the host city and the MLL. Final Score: Outlaws 16—Rattlers 12. 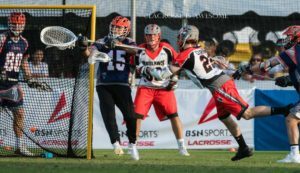 The Denver Outlaws (10-6) struggled early in the season but peaked towards the end of the year. The Dallas Rattlers (12-4) on the other hand seemed to be almost on a sprint right out of the starting gate for the entire season. Psychologically, emotionally and even physically, this may have exacted a toll on Dallas having been in their share of single goal/OT games (6-2) and a couple of two point games as well (1-1). The Rattlers have been in some epic battles this season with one more still to be contested. It was an overcast day, perhaps an omen for the Rattlers and what the final game of their inaugural season, the Major League Lacrosse Championship game held in-store for them. Dallas would lose steam in the late part of the second quarter and was unable to hold off the Outlaws onslaught. 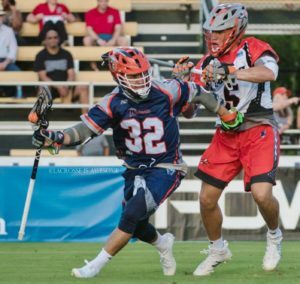 The Rattlers would lose 16-12, putting an end to a storybook season; and the Outlaws would walk away with their third MLL title and Steinfeld Trophy. Jordan Wolf (3G, 1A), assist Ned Crotty (2G, 2A) at the 7:16 mark. Wolf would score the games next goal unassisted; followed by Randy Staats (3G) scoring on the power-play, assist Ryan McNamara (1G, 1A). Wolf would finish off the run with his second coming at the 12:47 mark with D-pole Mike Manley (1A ,1GB) getting the assist putting Dallas up 4-3 and their first lead of the contest. It was short-lived as game MVP Kavanagh would assist Eric Law (1G) for his only point of the game. Kavanagh would score his second of the game off the assist from Currier ending the first frame with Denver on top 5-4. Starting off the second, Dallas would tie it up 5-5 on an unassisted John Ranagan (2G) laser 43 seconds in. Next up Wolf would net his hat-trick on the Rattlers second power-play goal with the apple coming from “the Crotty kid” putting Dallas up 6-5. The Outlaws would tie the game at the 5:00 mark off a nice goal by the 2018 MLL Rookie of the Year, Chris Cloutier (2G) with the helper coming from Kavanagh. Dallas would go on its final run of goals with Staats notching his hat-trick by netting back-to-back unassisted goals within a minute of each other. McNamara would score his lone goal of the contest off an assist from Jordan MacIntosh (2A) so to speak, and it was a McIntosh apple that put the Rattlers up 9-6 with just under five minutes to go in the first half. That is when the inaugural and storybook season for the Dallas Rattlers would come to an end. The Outlaws would score the games next seven unanswered goals. Starting it off was Mikie Schlosser (2G) at the 11:33 mark of the second frame. By halftime Schlosser (unassisted) had scored again as did Currier and Kylor Bellistri (2G, 2A, 1GB) both of whom were assisted by Kavanagh and at the half it was 10-9 Denver ahead, a lead they would not relinquish. In the second half the Outlaws would outscore the Rattlers 6-3, scoring the first three goals of the third before Ranagan scored his second of the night at the 10:21 mark, assist to Crotty making it a 13-10 contest with less than five minutes remaining in the frame. For the remainder of the quarter, both teams would exchange goals but at the buzzer Denver was still ahead 14-11 at the end of the third. would net two more goals, both unassisted. Final Score: Denver 16—Dallas 12 and another MLL Championship victory for the Denver Outlaws. The Outlaws have now won three MLL Championship Titles and three Steinfeld Trophies. Congrats to Outlaws Head Coach B.J. O’Hara and the Denver Outlaws the 2018 MLL Champions. Kudos goes out to the Dallas Rattlers franchise for such an amazing and memorable inaugural season. Dallas fans are rooting for their Rattlers to hoist “The Steinfeld Cup” in ’19.